I was a part of the Oyster Growth and Blue Crab research that was ran by Avery under Dr. Smee. Avery’s research consists of finding out how oysters sense blue crabs (predators) in effect hardening their shell for protection around their predator. She is also researching whether they can change back to a normal shell later and under what conditions that they will return. 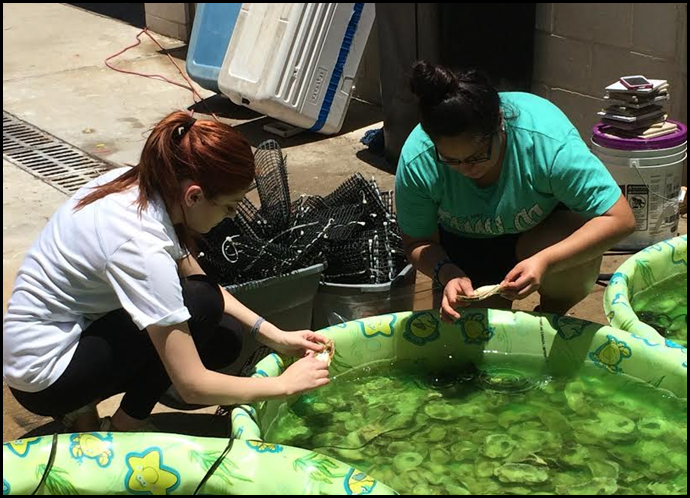 In order to conclude her research, measuring the strength, diameter and weight of the oyster shell will be collected as her data analysis. 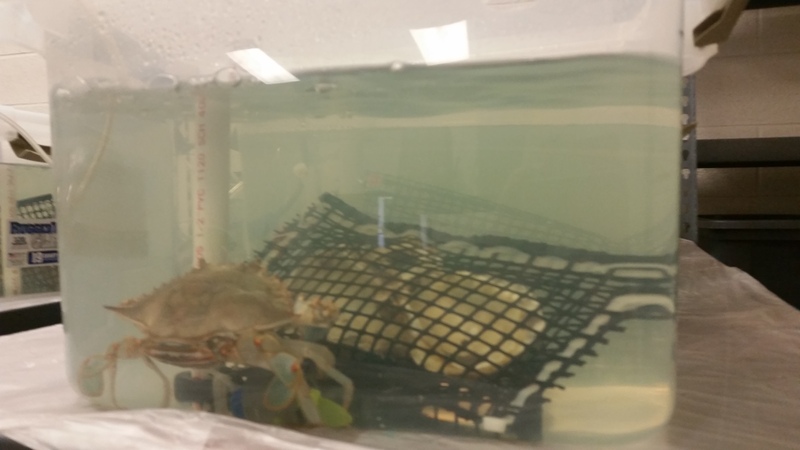 The other half of Avery’s research consisted of looking at how crabs’ diet affect the way oysters respond to the crabs, with the crabs being fed either freshly killed oysters or oysters that had been killed and refrigerated for 4-5 days. We zip tied and bagged the oysters for protection against the blue crabs (predators) . The bags of oysters were then put into individual tanks with 1 blue crab. We drained and changed the water to the tanks every Tuesday to ensure that the crabs and oysters had a healthy environment. We mixed 4 cups of Instant Ocean Sea Salt with 1 cap of water conditioner into 10 gallon containers. We made sure the salinity was measured at 20 by using a handheld refractometer. Avery then fed the oysters Phytoplankton and the blue crabs shucked oysters. Avery gave us the opportunity to see what it was like to collect data at the end of her research with a mock data collection. We were able to use a caliborator which measures the diameter of the oyster shell. We also used a penetrometer device that measured the pressure or strength of the oyster shells. Avery gave us the opportunity to let us in on some information about inferential and descriptive statistics that she will later be doing in her research. She met up with us to talk about an example mock data analysis using the mock data that we had collected earlier in the week. We made an excel worksheet creating tables and graphs based on our information collected. We also got to use the software ImageJ and measured the diameter of oyster shells to create our own excel data analysis using pictures of oysters that she had on hand from a previous research last summer. We had the opportunity to earn more hours by working with Joey on his barnacle research this summer. He explained to us the importance of barnacles and the purpose of his research. He also showed us how to dissect a barnacle and even got to dissect one on our own. It was a cool experience! Avery gave us another opportunity to learn about red fish farms in Flour Bluff. We received an informational tour of the hatchery and got to have a first hand look on what they do to keep red fish reproducing. We even had time to see Kelly’s research with her blue crabs. This tour was a great experience and eye opening. We were notified that the hatchery even does tours for local schools as field trips. We learned that being in the science field is very hard work. I am impressed by all of the researchers that we got to meet during our summer research with E Teams. – Check salinity when changing the water for the oysters and crabs. 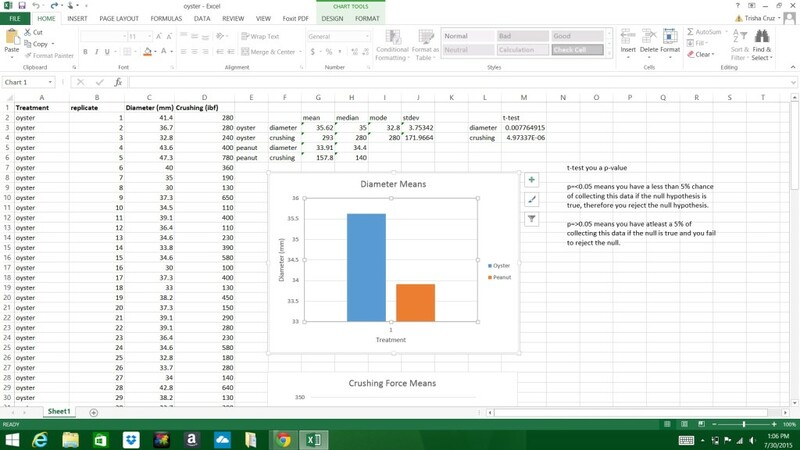 – Use excel when creating tables and graphs to record data analysis. – How to use instruments such as a refractometer, penetrometer, and calibrator to record diameter, pressure and strength of the oyster shells. -How to dissect barnacles and learning that there are special rules when going into labs. -We learned that research in science takes a lot of patience and consistency to get successful results. -We also learned that working in labs takes a great deal of responsibility and safety. After every days work we had to make sure everything was cleaned and put back in proper order. -We also learned that taking notes during research is very important as well as taking pictures along the way for accurate data collection. How long does the research last? What happens after you complete this research? 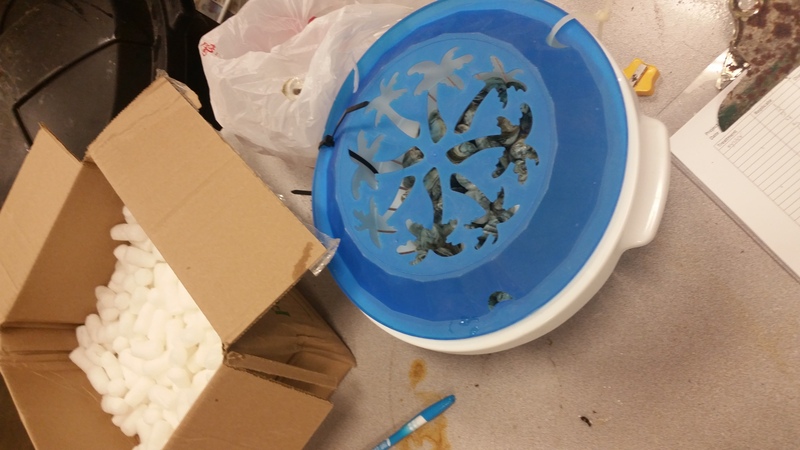 What do you do with the oysters and crabs that were used with this experiment? After your research this summer, what are your ideas on your next research in the future? What kind of information or advice will you give to elementary students who are not strong in science and math? The students will be able to learn the proper way to use lab etiquette as well as learning how to use the proper devices to collect data. The students will be exposed to new and reviewed vocabulary such as predator, consumer, freshwater, and saltwater, ecosystem, and population etc. §112.20. Science, Grade 8, Beginning with School Year 2010-2011. (D) recognize human dependence on ocean systems and explain how human activities such as runoff, artificial reefs, or use of resources have modified these systems. Thank You E-Teams & graduate students for this incredible experience!